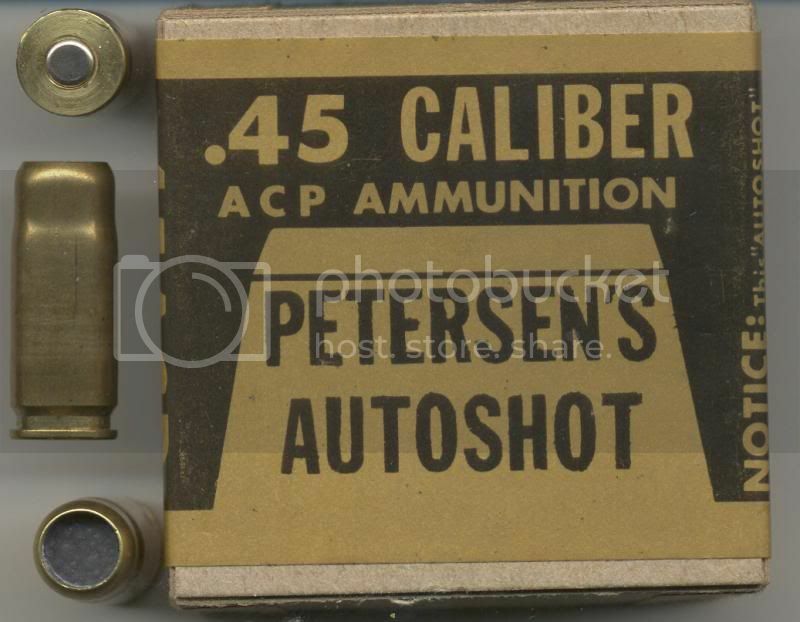 Recently some unusual loads showed up on some of the auction sites There are two names associated with these cartridges, “Synergy Business Development International” or SBD and “Extremely Lethal Projectiles” or ELP. It is not clear to me who these organizations are. Talking to the guy who has put the ammo up for auction, I understand he works for SBD as a marketing representative. It is unclear who or what ELP actually is and whether they are part of SBD or have a business relationship with SBD, for example selling them bullets. I’ve been told that ELP has been in business for some time, selling exclusively to military and LE customers-perhaps some Forum members know them or know of them either as ELP or some other name. The auction offerings are, I’m told, the first time ELP projectiles have been offered on the commercial market. I’ve also been told that ELP was originally located in the US, but because of US politics, has moved all their operations out of the US and now only have a very few sales representatives in this country. The ELP ammunition comes in a wide varitiy of calibers. Note all these loads use Winchester commercial cases. The bullets appear very well made. One of the 45ACP rounds has a bullet with a hemispherical metal tip on the bullet that is a bit hard to see. 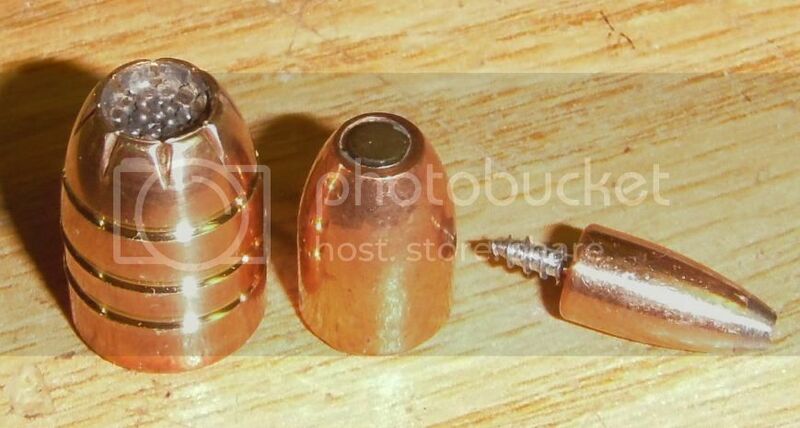 This bullet tip is magnetic so is probably steel. 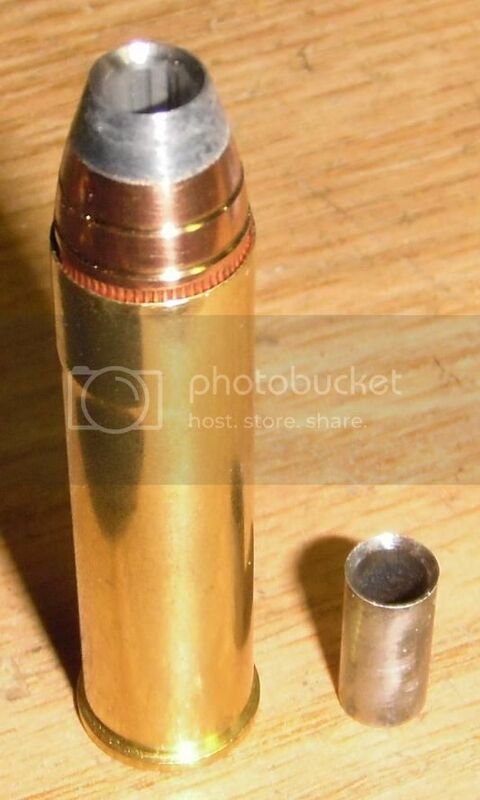 This is called an expanding bullet with a Stainless steel expander ball. Would appreciate any information on these organizations. I could only find a very generic web site for SBD and nothing on ELP. I asked for a corporate name and address and the seller declined to provide these indicating they were confidential. Lew, when I first saw all these amazing loads for sale I searched for more information on these companies, including patents, trademarks, or any other reference, and didn’t find anything. Also, the way these are made, their packaging, and their descriptions looks very suspicious to me. I believe that this is either one of the best kept secrets in ammunition development, or just a big fraud. Lew, I should have said this more directly: these are all FAKES. This individual named “Done Deal 2013” has created a whole universe of fake companies and products, and most of them are described as “prototypes” or “experimentals”. GunAuction is full of them and it seems that nobody is doing nothing about this. His fake products are described as made by Synergy Business Development Intl. (SBD), Extremely Lethal Projectiles LLC (ELP), Petersen Shotshells LLC (PS), ECO Solutions Intl., Covert Night Vision Systems (CNVS), First Counter Terrorist Systems Intl., Traders Tactical Inc., and P&S Training Intl. Fede, I was also concerned, but the bullets are beautifully made. I have talked to the sales guy quite a bit. He seems pretty knowledgeable about the ammo business. The color tip rounds were originally made with black and with white plastic tips in a test program-you may have seen some of these pictured in some of the ads. His story is that a woman who works in data collection at the test range suggested that they be made in different colors and marketed to ladies the same way gun makers are marketing colored pistols as lady guns. Other than the colors, the rounds are apparently identical. I’m convinced the bullets are not a fraud or fake, except for the claimed performance of course-as John Moss points out regularly, there are no magic bullets. In fact, someone has some pretty fancy machinery to make the bullets, in my opinion. I suspect they are from somebody we already know, like Liberty (Halo ammunition) and some of these bullets look like the poor photos of some of the Liberty LE loads on their website. I thought about Lehigh, but they seen to only make turned bullets and these are far more complex than anything I have seen from Lehigh. 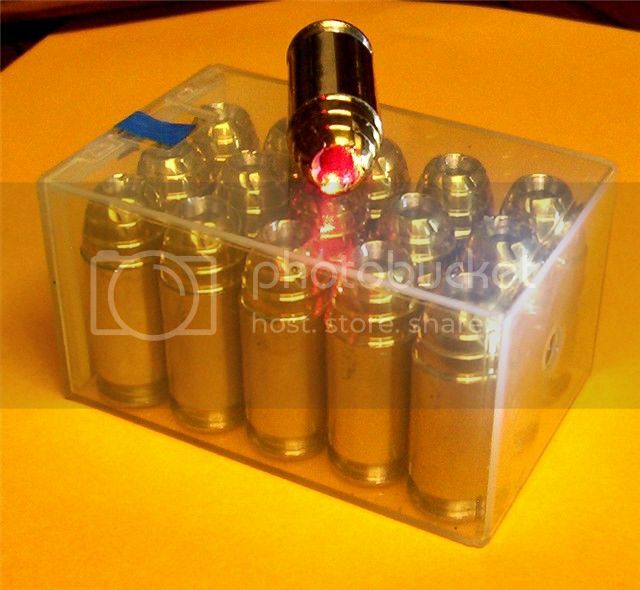 Another possibility is Allegiance (old Extreme Shock) who made some pretty exotic bullets. At the ShotShow a few years ago, there were some people who looked like they had the ability to make some pretty exotic items and one of them may be the source. I don’t think what we are seeing is the actual packing. Based on things the sales rep has said as I talked to him about 9mmP loads, he may be getting left over loads, from the manufacturer and packing them up in small packets. He has said that this is actually a market test which is why he will only sell at auctions. I have wondered if, in spite of his card or maybe because of it (He lists Petersen’s Shotshells and ECO Solutions lead free projectiles), he is just a guy who somehow has access to this ammo and is making a killing on it. Perhaps it is only the bullets he has access to and he is loading them but there are a wide variety of bullet calibers and types. If he is making these bullets he has some pretty good facilities and talents. He also indicated that these have been sold on foreign auctions also, but I could not find any indication. I just went out and found his latest post, which makes no sense to me at all. So who knows-but I like his ammo. It is not a real business in any sense of the word in so far as a licensed dealer or anyone with an FFL-06. “Synergy Business Development” is completely made up and does not exist beyond the one person (Ed Peterson). 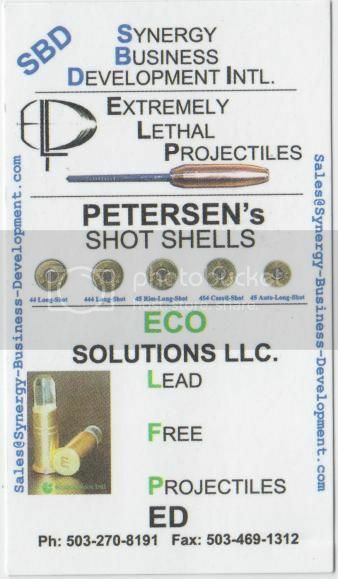 He has different business names which all fall under the umbrella of Synergy Business development such as “Extremely Lethal Projectiles”, “Peterson’s Shot Shells”, and “ECO Solutions LLC”. His listed address in Beaverton, OR is a residential house when looked at on Google street view. He is skilled at machining custom projectiles with a lathe, re-sizer, and loading in general. Aside from those issues, there are some questionable descriptions he uses in his auction listings (the only place you can buy from him - he has no website) where he will describe things like “FN deciding to continue their relationship with Synergy Business Development” so that the development phase of projectile testing may continue… which is silly, FN has no idea who Synergy is and has no relationship with him. He also describes some of his loads such as the .460 S&W cutter as being developed as a back-up load for a big game hunter and how it has a stainless steel tubular cutting core… - I purchased some of these and they were nothing more than .460 factory loads with the jacketed lead hollow point tip hollowed out a little to accept what looked like a tubular section from a piece of hobby piping or a pen or something. The steel tube was placed well and beveled to be in line with the hollow point it was inserted into, but it was magnetic, and thus is not stainless steel. He does other things like loading ball bearings into the tips of hollow points, or loading colored plastic beads, or exploder tips with primers. He makes a whole bunch of weird custom loads in pistol projectiles mostly and does some really nice looking work, but also does some completely ballistically neurotic things like inserting rivets in through projectiles or screwing screws into lead hollow points and passing them off as being super high quality accurate projectiles (I can’t imagine). It’s too bad really because much of the work looks great, but his exaggeration and lying makes for some weird made-up provenance and over-hyped history. He was originally only selling on Gunauction (Auctionarms), and may still be, but he seems to have shifted mostly to Gunbroker for obvious reasons. He also does some extended case shotshells under the Peterson name and these are alright, and seem to have a lathed-down headstamp which then has a laser-etched or machine-etched headstamp of his own. He does everything in relatively small quantity and has some really nice looking quality pieces, but the descriptions and the Amway-esque feel I get from it all is a shame. Wow… So he makes a 12x1 Metric thread (FN) to soda-bottle adapter for people to use a one-time junkyard type silencer? I have heard of adapter nuts like this which are usable with oil-filters to be considered “silencers” in themselves by the BATFE, so he may want to watch his step lest he become the next Aron Lipman. Wow this is just great guys, thanks from, I’m sure, all of us. I figured you were watching this guy. I think you and I may already know him. You and I both have some specimens from our friend “Al” who lived near Spokan WA, and disappeared with an interesting story quite a few years ago, and then resurfaced briefly. Second hand I heard that he use to work with some of the people up near Spoken who make wonderful ammunition like MagSafe. Beaverton OR is about 350 miles from Spoken but still in the same general part of the country! Al did beautiful work on some of his stuff, and he never sold it but apparently made it to try out himself. Perhaps he has reinvented himself and is back to some of his old wild stories. It kind of has the same feel to it today as Al did about 10 years ago. Al was a real craftsman. Still I wouldn’t call these fakes or frauds. He is selling some of these rounds for little more than shooting prices. I can’t imagine anyone putting that amount of work into hand making these and then selling them for about what DRT and RCBD and others charge for their “special” loads. I agree the screw out the back of the bullet is pretty cheesy. I had thought of Al, but I don’t think it’s him. This stuff from Ed seems much more precise with some real machining ability shown. Al (or whatever his name is), still sells things on Gunbroker, and still has an address in Spokane, and I would think he would know better than to be so outrageous in his descriptions, knowing that we would know better. which has an FFL Dealer License ( atf.gov/files/about/foia/dow … oregon.txt ) with Charles J. Petersen as the holder. Seems like their multiple companies run out of a residential home. Sounds like some gun enthusiast, with machining background that are just trying to make some extra money. Or maybe one of them worked with some secret defense contractor now or in the past, and is selling prototypes behind the employer’s back, under an assumed name, so it is not linked back to the original contractor? Looks like an 01-FFL for buying/selling/trading firearms and ammunition. Charles must be a relative, probably father. Not having an FFL-06 to manufacture ammunition, and doing the assorted loads with steel inserted into pistol caliber projectiles, he should be careful since the FFL license holders are scrutinized and held to a higher standard than the average citizen. Great research everyone and many thanks! You guys who know how to use the Internet are awesome. I think Aaron and DK nailed it. This is a guy, or guys who are wantabes and have some talent and time and facilities to manufacture some pretty classy bullets. Since they are being sold as shooting ammo at about the same price other exotic bullet rounds sell for, I wouldn’t call them FAKES, but from what you guys have dug up, I do think FRAUD is involved. The International Competition auction postings are bizarre, and I don’t even understand what is being sold. It is not the first time I have seen people in this business let their imagination run away with them and they start talking about what they wish as fact instead of the day-dreams they are. For all I know now, these rounds may function as described. If I had a lab, I’d test a few to see how they worked. If somebody out there has a test facility and wants to try a few of these loads, let me know. Since they are sold as shooting ammo, I’m going to put them in the collection, along with the story you guys have dug up. Again, many thanks. DK, thanks for the info on Al. In your dealings with Arcane, does he call himself “Al”??? With all Al’s ammo interests I’m surprised he doesn’t list any ammo. You are right. I think this guy is on thin ice with the ATF! I don’t think that there is any indication that “Petersen & Son Gun Exchange” in Beaverton, OR is related to this individual. His current address is also listed as “Tualatin, OR 97062”, but this is probably false, as everything around him. A few months ago his address was also noted as “Hawaii (HI)”. "Lew & Matt, in my opinion this individual has made up everything, from A to Z. This is probably his most ridiculous delusion: gunauction.com/search/displa … m=11847771 "
Does anyone remember from over 20 years ago this same sort of thing being advertised in some of the gunmags? Basically, it was an adaptor which attached to a gun muzzle, to which a plastic soft drink bottle could be screwed into, acting as a sound suppressor. You had to provide your own plastic soft drink bottle. Looks like to me Synergy Business Development is making some pretty neat stuff. But obviously they do not know one end of a bullet from the other. A wood screw sticking out of the base of the 22 is that so you can screw two bullets together? Would like to see some of the bullets shot both for accuracy and into ballistics gel. The proof is in the pudding. Sounds like the old scam of pay me for forwarding your $1M lottery winnings. Picked up another item from our friend. This was a box of 45ACP shot. Clearly he produced these. He uses his name on the label and the address is Ammunition Sales Mfg, Gresham Oregon 97030. The cases appear to be 7.62 NATO with the headstamp turned off. One of the rounds has the remains of a NATO (+) on it. Looks nicely made. I also picked up some of his other items, mostly in 380 and 5.7x28mm. He does some very pretty work, including 380 and 40S&W with the steel balls in the tip like the 45 ACP I pictured above. It is interesting. I have pushed on him for 9mm, and he has said that he can sell all the 9mm he can get his hands on. I pushed him pretty hard about 9mm versions of his steel ball loads and some of his other loads he offers in 380, but he doesn’t have/can’t get any. If he is making these bullets, then it would be very simple to put the same steel ball he uses in his 380 into a 9mm and sell them for some $s to me and likely others. I have tried to buy 25 rd or 50 rd boxes of the 9mm from him at more than I paid per round on GunBroker but no luck. He had a photo of 9mm with black and white plastic balls in the tip, but he “couldn’t locate” any of these for me. I offered him considerably more than he is selling his ammo for on GunBroker if he could provide these steel ball loads and his EXP1 load in 9mmP, he sells them both in 380. His answer is that he couldn’t get his hands on any. If he was making this stuff in his garage I suspect I’d have all kinds of stuff in 9mm. Maybe I could even have scored one with a screw tip!!! Also strange that he only sells on the auctions. Back in early July I offered him about three times per round what he had sold the small quantity of 9mm for back in June. He said his agreement didn’t allow that but promised he would go back to his source and see if they could find any 9mm anywhere. He put what he found back on GunBroker at the same “Buy Now” price as his June sale!!! Something here I don’t understand. Wish one of you guys up in the Northwest would go by and visit him! My guess has been that the sales all happen at auction so that if concerns over being an unlicensed “manufacturer” arose and if he has no FFL-06, then he could claim that the cartridges all came from elsewhere, as he sort of does. On those shot loads, I had seen them in his original promo materials with some kind of etched headstamp, but I’m assuming that this is tedious and not done anymore. I notice that he is delving further into the realm of legal precariousness with versions of his steel cutter projectile being sold now in .40S&W and .45 auto. These are a little more overtly pistol-caliber than the .460S&W which this projectile type was offered in exclusively a couple months ago. He describes it as a long lost product of Synergy business development which was made for a super secret special contract or something to that effect (these were made by him in recent weeks). They are just Remington Golden Saber bullets which have had his stepped resizing treatment on the bullet which basically does nothing other than make it look cool. He is also doing a trick in several listing photos where he has a laser pointer off camera which points into the hollow core of the bullet to make it glow, why I can’t say.